When our contract was settled in early July 2014, Simone was making just $10.94 an hour. Over the life of the new contract, her pay will rise 20 percent to $13.13 an hour. For Simone, who was living in a shelter when our contract campaign began, that extra money will give her a better shot at finding an affordable home. When Simone Hicks got a job at Johns Hopkins Hospital last year, she thought her years of living in a homeless shelter were finally over. Simone had lost her previous job during the recession — and then she lost her home to a predatory lender. Ever since, Simone has struggled to keep a roof over her head. She’s been living in homeless shelters and transitional housing for the last few years. And so when a job placement official came to her shelter offering positions in environmental services at Hopkins, Simone jumped at the chance. But the $10.71 an hour starting salary had her thinking otherwise. 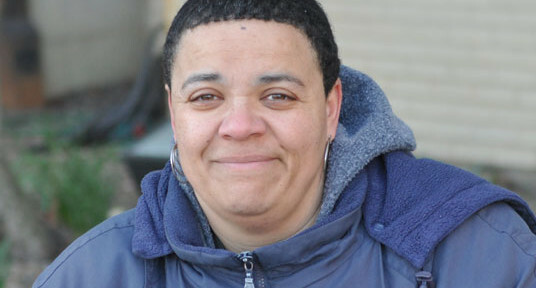 And with her meager paycheck, Simone hasn’t been able to find safe, affordable housing. Some assume Baltimore has ample affordable housing because it’s cheaper to buy a home here than in Washington or New York. But it’s actually the worst housing market on the East Coast for renters. Among big East Coast cities, Baltimore has the highest share of renters paying over 30 percent of their income for housing, the percentage that’s considered affordable. In fact, more than 53 percent of Baltimore renters are stuck in unaffordable housing. Even worse, there are all too many others like Simone who lack any home at all. One of the key reasons for Baltimore’s affordable housing crisis is the chronically low pay offered by employers like Hopkins. Johns Hopkins Hospital is the city’s second largest employer, and 93 percent of the union workers at Hopkins make a wage that’s too low to affordably rent an average two-bedroom apartment in Baltimore. When the city’s second largest employers offer such low pay, they’re not only hurting caregivers like Simone — they’re dragging down standards for workers all across Baltimore.